Vegan Chicken Fried Mushrooms are based on the traditional “chicken fried chicken” I had as a kid. Made with oyster mushrooms marinated in a garlic marinade, baked until golden brown, and topped off with homemade gravy. Rich, flavorful, and crispy! Yearssss ago, before I was vegan (or even knew what the term “vegan” was for that matter), I was in Lincoln, Nebraska with my family – a far way away from our home in Toronto. I remember being in Lincoln, out with my family for dinner, and I had “Chicken Fried Chicken” for the first time ever. We usually didn’t eat such heavily fried things at home and I remember thinking it was such a treat. Flash forward to two almost two decades later and I am out downtown Toronto and had THE best crispy oyster mushrooms ever. I remember thinking that the crispy and crunchy oyster mushrooms reminded me of the meal I had 20 years ago as a kid. A few kitchen experiments and recipe trials later, my Vegan Chicken Fried Mushrooms came to be! And guys, are they ever tasty. These Vegan Chicken Fried Mushrooms start out with a homemade marinade. Made with lots of garlic (there’s never too much garlic in my books), soya sauce, balsamic reduction, herbs, and lemon. Oyster mushrooms are like sponges in that they soak up so much of the homemade garlic-soy marinade. I cut off the hardest part of the mushrooms stem (just the very bottom), wash the mushrooms and put them directly into the marinade. 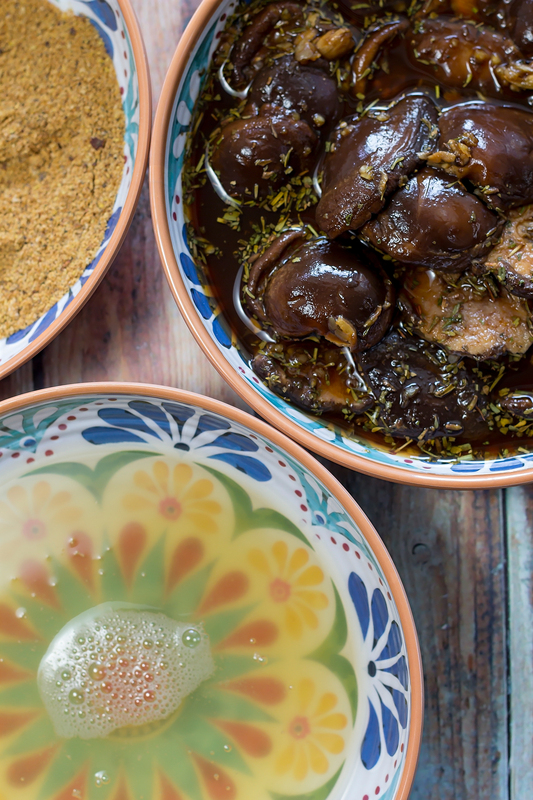 Marinate your mushrooms anywhere from 30 minutes to overnight. 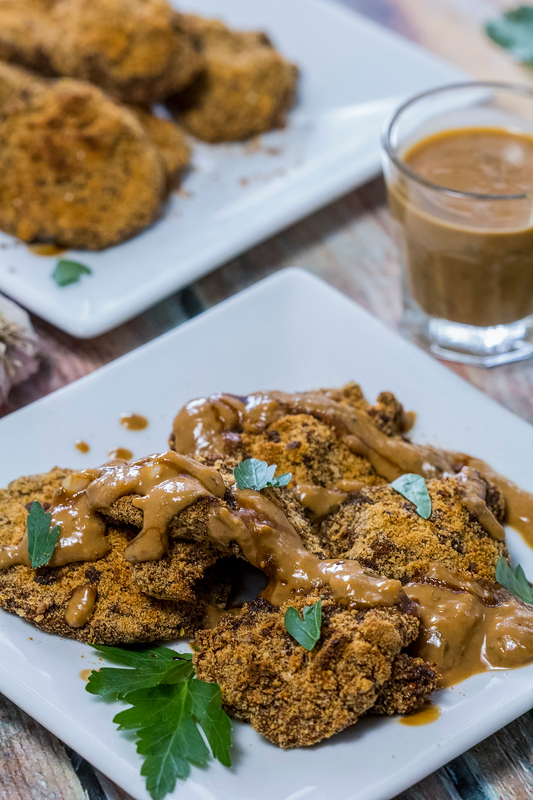 If you are able to make your Vegan Chicken Fried Mushrooms a day in advance, marinating your mushrooms overnight really does make a big difference in terms of flavour. Dip each mushrooms in the vegan “egg” (aka aquafaba) and then the crispy breadcrumb mixture. Whatever you do, do N-O-T toss out the marinade, this is the base of your gravy!! Place on the baking sheet. 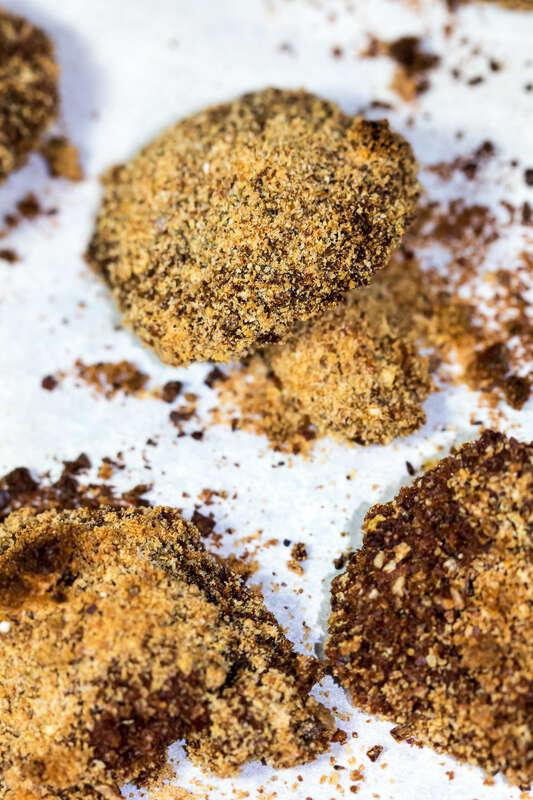 I use a stone baking sheet to make the Vegan Chicken Fried Mushrooms extra crispy. Drizzle with gravy. Serve these Vegan Chicken Fried Mushrooms with appetizers, over pasta, potatoes, rice, or as a side! Enjoy. [b]Make the marinade:[/b] Whisk together minced garlic, herbs, soya sauce, lemon juice, balsamic reduction, bouillon, and black pepper until creamy smooth. 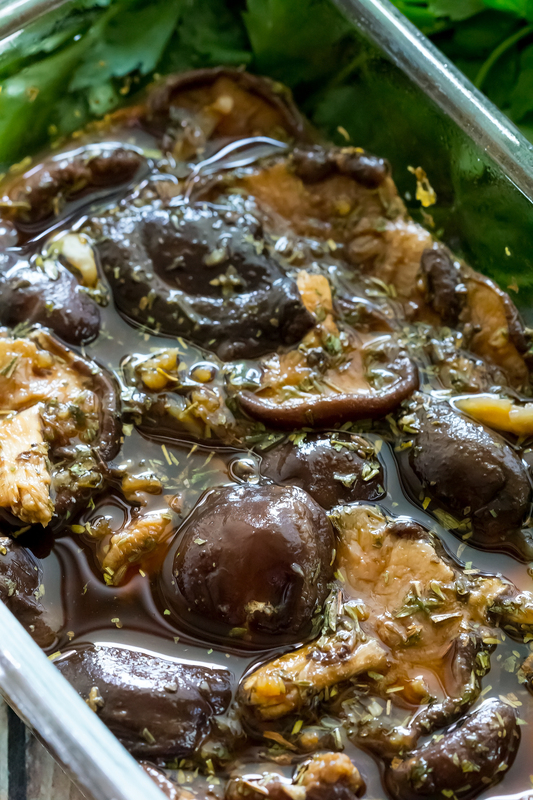 Wash the oyster mushrooms and toss them into the marinade. The mushrooms are like sponges and will soak up the marinade. Marinade for 30 minutes to overnight in a covered dish in the fridge. [b]Bread the mushrooms: [/b]Preheat oven to 475F. Line a stone baking pan with parchment paper. Pour aquafaba into a small bowl (this will be the eggy mixture so the breadcrumbs stick to the mushrooms). Mix together the breadcrumbs, nutritional yeast, and black pepper in a second small and deep bowl. 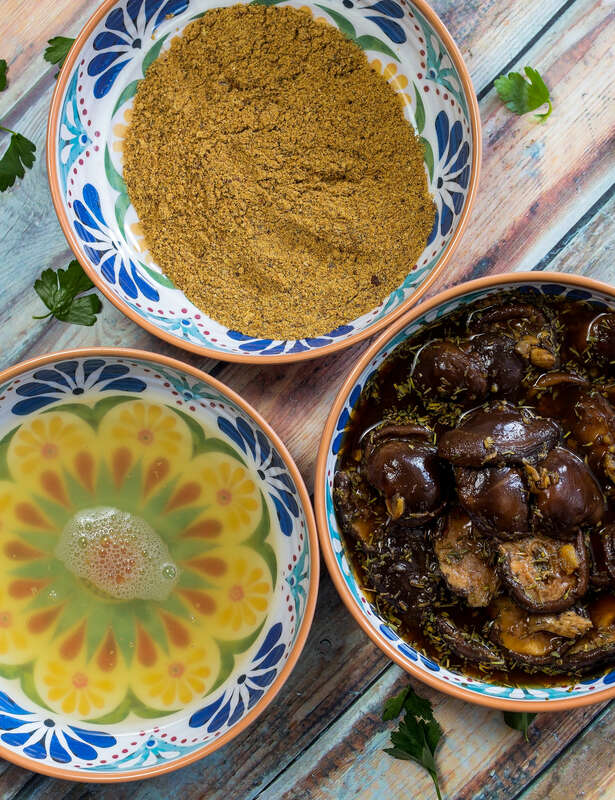 Dip each mushrooms in the aquafaba and coat well with the breadcrumb mixture. [b]Bake the mushrooms: [/b]Place each breaded mushroom 1/2 inch apart on the baking sheet. Bake for 15 to 22 minutes until crispy and brown. Broil for the last two minutes of baking. [b]Make the gravy: [/b]Do not discard the marinade ([u]this is the base of the gravy[/u]). Add the marinade to a medium size pan. Add the cashew butter and 2 tablespoons of water. 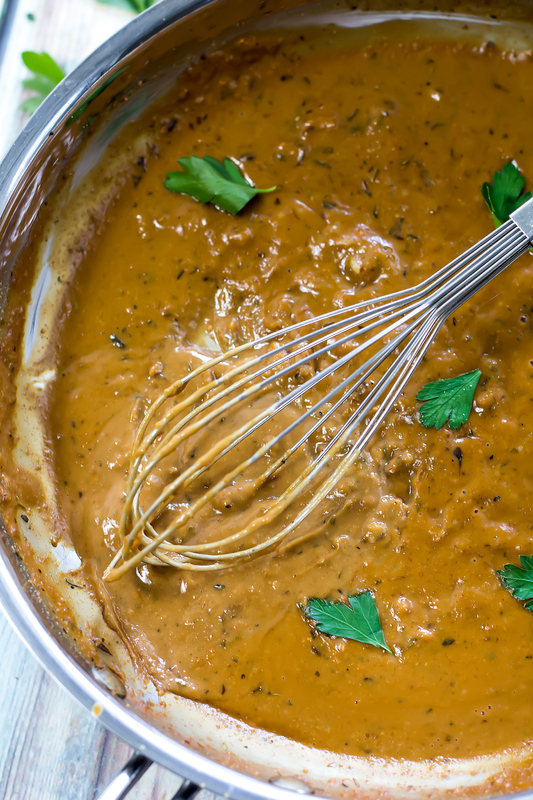 Whisk frequently until the cashew butter melts and the gravy begins to simmer and thicken. Simmer on low until the mushrooms are ready. Add additional water to the gravy if it gets too thick. 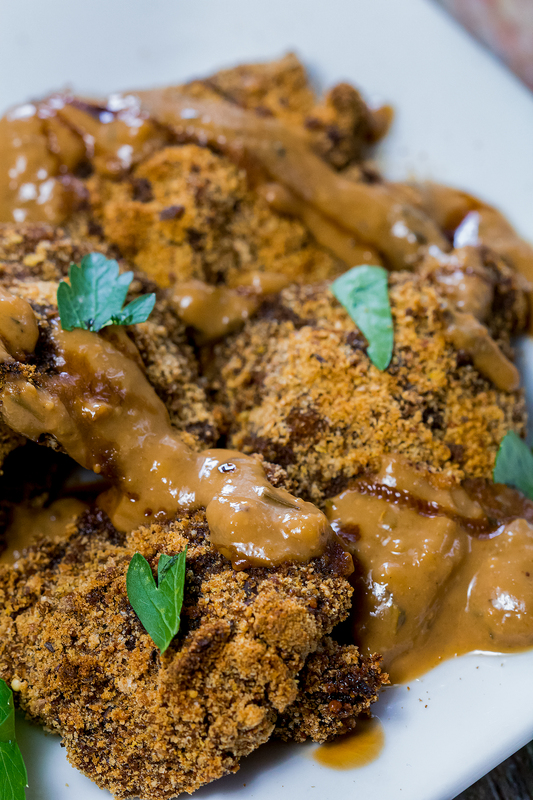 Drizzle the Chicken Fried Mushrooms with gravy and (optional) balsamic drizzle. Enjoy! 1) Gluten Free is using gluten free breadcrumbs. [br]2) Using a [url href=”http://amzn.to/2tm4iss” target=”_blank” rel=”nofollow”]pizza stone[/url] instead of a baking sheet helps to make these mushrooms extra crispy. May I check with you, the mushrooms in the is not Oyster mushrooms, in Asia we called it Shiitake Mushrooms, are you using the picture mushrooms to make this recipe? Hi Ceara, I can’t wait to make this! How many/size portions is this? Not only do I want to make this, but I also want to use this for a term project for my nutrition and dietetics program in which we have to include a day menu of a culture as part of designing a cycle menu for a hospital….I chose soul food in celebration of Mardi Gras. My make-belief hospital is vegan of course 😉 Gotta show everyone how amazing and healthy hospital food can be! Thank you for another awesome recipe! These are crazy good! First thing I’ve made from your blog was amazing! Don’t have a pizza stone, but they were so crisp just on a regular baking sheet. Served them with mashed potatoes and greens (the local farmer’s market had sweet potato leaves—sauteed them with some onions, garlic, and maple syrup!). Made extra gravy, which was also fabulous. I’ve seen some posts with similar mushrooms that are deep fried. Of course yours are so much healthier—no guilt! I’m a long time vegan who hasn’t eaten meat in ages, but I swear that non-vegans would enjoy this and not even know that it wasn’t meat. I can’t thank you enough. 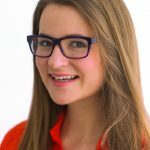 I was wondering what mushrooms you would recommend if I am unable to find oyster mushrooms? Not sure if I have any available in my area. Thanks! I recommend lining the pizza stone with parchment paper! Hi Ceara, I don’t have any cashew butter. What else can I use please? Hi Ceara: I’d like to make the Vegan Yogurt and am wondering if this works with any non-dairy milk, or only soy milk. Thx.